Hinduism is the name we have given collectively to a group of religious traditions that originated and developed in the Indian subcontinent for the last 6000 years or so. The most dominant of these traditions are Saivism, Vaishnavisim, Shaktism, Vedism, Tantricism, and several ascetic and folk traditions, which are now part of Hinduism and whose identity is difficult to establish separately. In addition to these, several schools of philosophy became part of Hindu tradition, the most popular of them being Samkhya, Yoga, Nyaya, Vaisheshkia, Mimansa and Vedanta, which are presently designated as the Darshanas or view points. It is a fact that in the west many books and educational programs on world philosophy ignore these six schools of Indian philosophy and focus more on Greek philosophies, which is an unfortunate trend, because by not knowing about them, the western world has been overlooking a vital link in the development of human knowledge and religious thought. This is not because these schools have any demerits compared to the Greek philosophies, but because they are rooted in Hindu religion and to teach them one has to include the basic concepts of Hinduism in the academic curriculum. For many academicians in the western world, doing so is worse than teaching evolution. In a world dominated mostly by Christian institutions and funded by Christians, it would require immense courage on the part of academicians to rewrite their books of philosophy and glorify the so called pagan religions, without incurring the displeasure of the conservative people, who want their children to be brought up only on Christian values. To suppress all forms of opposition, either by force or by condemnation has been the way of the western eclectic world, since earlier times. Since the earliest times, the Church has rarely been kind to any notion of insubordination or heresy. It happened in the Roman period to Gnostics and others who opposed the distortion of original Christian teachings or deviated from the official version approved by the Roman authority. It happened again in the medieval period to the so called witches and scientific thinkers, who were burnt on the stakes, on the grounds of religious blasphemy; and it has been happening right now, in a more civilized way, to philosophies that are based on religions like Hinduism, Buddhism and Jainism, and scientific research and theories like evolution that seem to challenge the Biblical notions of creation. Of these six schools only one, Yoga, has become popular in the western world, unfortunately, not as an aspect of Hinduism or Buddhism or the means to achieve self-control and self-realization, but as a set of mere physical and mental exercises to enhance one's well being and energies, devoid of its true philosophy, intent and purpose. 1. It is a very flexible, assimilative and adaptive religion, with a broader outlook and many divergent traditions. It is not dogmatic, because it is not based on a particular set of teachings, scriptures or a founder. Its flexibility gives it the special ability to adapts itself to the changing times, without losing its vitality, core values or focus. Hinduism acknowledges that the world is unstable, human mind is fickle, our beliefs and circumstances can change, but Truth is permanent and unchangeable, and it is this Truth it encourages its followers to seek by whatever means they consider appropriate. 2. There is no centralized authority in Hinduism. So any one can be a Hindu, without the need for approval from any one. There are no compulsions to observe any code of conduct, as long as one can find their basis in some scripture, school of thought or the teachings of a guru, saint or seer. One can be even an atheist and still a Hindu. 3. It is not opposed to scientific exploration nor the technological progress of mankind as long as such an activity is not an end by itself, but part of our divine centered search for Truth. It has the ability and flexibility to align itself to both science and spiritualism as two different tools of knowledge. 4. There are many layers within Hinduism. It has something for every one and every strata of society and offers a broad spectrum of solutions to the problems of human life. From the most ignorant to the most knowledgeable, every one can find solace in Hinduism through ever lasting solutions to their existential, spiritual and personal problems. 5. Hinduism is a peaceful and tolerant religion. Because it is a composite religion, it has no issues with dogmatic religions which are based on the teachings of a founder or prophet. Its broader religious and philosophical base allows it to find parallels within other religions and coexist with them without feeling threatened or the compulsion to establish its superiority. Hindus are perhaps the only people in the world who have never launched an aggression on other nations on religious grounds. And Hinduism is perhaps the only religion in the world that survived over 700 years of Islamic oppression and 400 years of Christian propaganda. 1. Hinduism is caste based. Castes in Hinduism are part of Vedic tradition, which is but one aspect of Hinduism. There are other traditions in Hinduism, which do not acknowledge castes. The castes might have served their purpose in ancient India. But today it is one of the chief weaknesses of Hinduism. Birth based caste system is responsible for disunity and discontentment within Hindu society and exodus of many people to other religions. It is also a great hindrance in assimilating many people from other parts of the world, who want to be part of Hindu society. 2. Besides caste, there are many other divisive forces at work within Hindu society, such as region, language, sects, gurus and even color and race. They keep the society divided, weak and vulnerable. This division runs so deep that even those who migrate to other countries or who have been living there for decades, form caste based, region based or language based associations and try to keep their caste and linguistic identities intact. 2. Hindu dharmashastras or law books have a particular bias against women and their role in family and society. Currently Hindu women are subject to many social and religious disabilities. 3. If absence of a centralized authority enables Hindus to practice their religion with greater freedom, it also make a vast majority of them irreligious, irresponsible and vulnerable to decadent ideas and practices. The most unfortunate part is many are not serious about their religion, have little understanding of traditions or scriptures and hold on to erroneous ideas and beliefs. Justification of violence, vulgarity in films, unbridled materialism, lack of sincerity and personal integrity are some of the dominant features of Hindu society in India today. When children notice inconsistency in the religious attitude and moral behavior of their parents, they would not develop respect or admiration for the religion in which they are born or the morality it upholds. If parents are ignorant of their religion, they cannot make their children religious. They easily take to western ways and ignore their own traditions as empty rituals bereft of merit or distinction. 4. Diversity of Hinduism is both a strength and weakness. It creates a lot of confusion in the minds of people, as to which path to follow, whom to worship and what to practice. We have many scriptures and teachings of countless gurus and traditions and do not know what to study and what to ignore. A vast majority of Hindus therefore practice popular religion because it is easier to do. They go to temples, follow a religious guru or his or her teachings, do some pooja at home, believe in some practices and superstitions, but are hardly well versed in our scriptures, traditions and practices. So there is a great disconnect between what they practice and what they should ideally do. 5. Decay of traditional institutions. While Hinduism does not have a centralized authority to regulate its affairs, over these centuries it survived on the strength of some of its traditional institutions, recognized in Hinduism as the upholders of Dharma. These are the institutions of family, gurus or spiritual teachers and king or the political authority. These institutions are now in grave danger and unless we find some effective remedies, Hinduism will be a thing of the past. Hindu families used to be joint families, in which children had a great opportunity to learn about their religion, religious practices and family occupation from their elders. Through the practice of dharma, parents used to serve as the role models for their children. The Hindu family as a social unit underwent a great transformation in recent times. Joint family system is almost extinct. In the family structure that we have now, parents are no more performing their obligatory duty as the role models of dharma for their children. They are too busy to worry about the religious knowledge of their children or the values religion can teach them. They believe that it is the responsibility of the education system, which is in itself defective and narrow in its scope and function. Financial solvency not individual salvation is the current mantra of many Hindu parents. Their main concern is how to educate their sons successfully so that they would get a good job and lots of dowry and how to get rid of their daughters as early as possible with as little dowry by finding a suitable match!. No wonder, when they reach these goals, most of them remain neglected by their children and live unhappily. The institution of religious teachers is also on the wane, with so many dubious characters, claiming themselves as enlightened beings, or confining their teachings to particular sampradayas or some mumbo jumbo yoga practices. Regarding the political authority in India, the less said the better. Now a days it is easier in India for a dacoit or a criminal to become a legislative member or even minister rather than a religious teacher or a temple priest or a brave soldier. 5. Superstition and obscurantism. There are many superstitious and obscurantist practices of Hinduism, which degrade the religion and make it vulnerable to criticism from within and without. The gravest threat to Hinduism in India today are political, social and religious in nature. The political threats are mainly caused by the parochial and opportunistic politics played by the political parties in India and the so called secularism in which criminals with a track record of police complaints and leftists with atheistic inclinations are welcome, but religious people with social and political aims are viewed with grave suspicion and dubbed as Nazi. In the lexicon of Indian politics, secularism means not to speak for Hindus as a religious group and keep a distance from them on any national or social issue. Probably this trend will likely continue indefinitely, unless Hindus themselves become a minority and prove useful in the factional politics of exploitative political parties. The social threats are mainly in the form of growing western influences and the dilution of religious activities in the day to day life of individuals. Children in schools, and people outside, who are serious about their religious or moral values, are ridiculed by their friends as traditional and orthodox stereotypes, while those who follow western values and life styles, which are themselves considered decadent in the west, are considered hip hop and progressive. The religious threats come from the activities of violent religious groups both within and without, religion based political parties and social institutions opposed to Hinduism and the organizations that use money and material for conversion of Hindus into other religions. 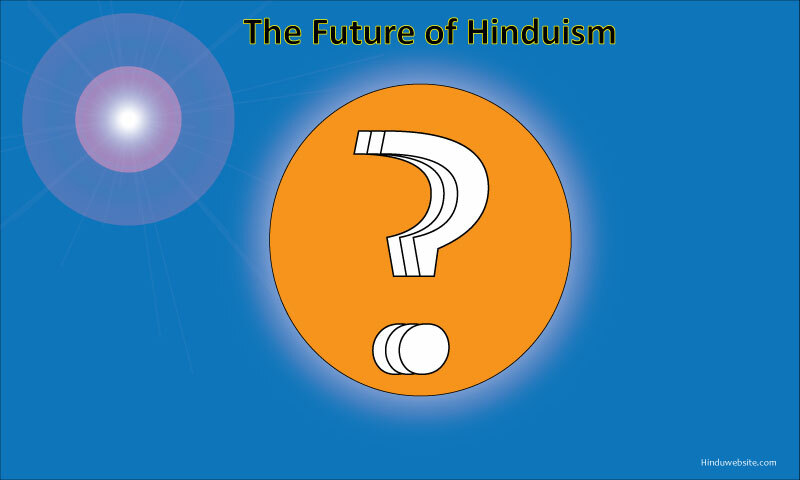 Hinduism can become a dominant and vibrant religion of the world, through the strengthening of its traditional institutions, namely the institutions of family, of gurus or spiritual teachers and of private organizations, filling in the void left by the political authority, supporting a wide range of activities that are aimed at inculcating the values, knowledge, teachings and activities upheld by the religion and its scriptures. We should also aim to develop either a casteless Hindu society or a society that is structured not on birth based castes but profession based ones, which was probably the ideal of the original Vedic people and part of their cosmic vision. This will be possible only when we are willing to teach the Vedas and other scriptures to qualified people from the so called lower castes and appoint them in our temples and religious institutions as priests and religious heads. It is not that this is going to be a new tradition. It has been practiced in Saivism for the last several centuries. It has the approval of the scriptures and many gurus. We need to make it more universal. In the absence of traditional family structure and when the education of children is not rooted in religious and moral values, it becomes the sole responsibility of parents and grand parents to become role models for their own children. The best way to do this is through self example, by practicing religion and maintaining integrity in way that would strengthen children's faith in their religion and respect for their parents. If parents are religious and show consistency in their thought and action, children would believe in them and imbibe their religious values. But if parents are irreligious or if children are not convinced of their parents' religious beliefs and moral values, they would develop skepticism and disbelief and become alienated not only from their parents but also from what they believe in and stand for. Lack of moral and religious integrity is a major social issue in Hindu society today, and if parents do not address this problem seriously in their individual ways, they will become victims of their own actions and suffer from the irreligious behavior of their own children, which is what we are already seeing happening in various families. You cannot expect your children to be religious and carryout their obligatory duties as your children, if you do not undertake your own traditional responsibility as a parent and educate your children. Parents should take this matter seriously to save themselves and their children lot of trouble. The institution of religious teachers is somewhat vibrant today. Our religious teachers seem to be doing a great service to the cause of Hinduism. Many of them are well known world personalities. They participate in international conferences, travel all over the world, receive honors from governments and world bodies for their meritorious work, set up spiritual centers in various parts of the world and provide spiritual guidance and mentoring to millions of seekers. While this is a positive development for Hinduism, most of the institutions and movements initiated by the religious gurus, somehow, degenerate into mere sectarian movements over a period of time or lose their direction somewhere, following the demise of the original founder or due to the petty politics of his followers in their struggle for leadership, money, power or position. Secondly, most of these teachers preach their own brand of Hinduism, which is like a concoction brewed out of existing Hindu scriptures, and give it a brand identity of their own, just as the way commercial institutions in the west brand their products to distinguish them from similar products of other companies. Some are even hesitant to call their teachings Hindu, in the hope of drawing followers from other religions, and try to come out with a synthetic philosophy that is neither convincing to the followers of Hinduism nor other religions. Thirdly, the gurus are worshipped by their followers as divinities, instead of as spiritual teachers. They do not see God in their gurus and respect them for that, bur rather the physical body of guru only as God. Hinduism has already thousands of divinities. So one wonders why we need more! If we want to protect and preserve Hinduism, we need spiritual teachers of different kind, teachers whose sole purpose would be to preserve the core knowledge of Hindu dharma and help capable people achieve self-realization through spiritual practices. In ancient India serious students of spirituality had to take enormous risks to find their way to a spiritual teacher, who often lived in inaccessible areas for a purpose. This is in contrast to most of today's gurus who rarely stay in their ashrams, helping their serious students. They travel far and wide to reach out to people who are less than half serious or who look for gurus for material benefits. What we need today are gurus who can open the doors of enlightenment for people who are worthy of higher knowledge and who in turn can preserve and continue the tradition of their masters through their own enlightenment. We have to accept and respect gurus for what they are, teachers who can show us the way and connect us with ourselves. In the process of teaching detachment if gurus succeed only in creating a new attachment between themselves and their followers, the whole purpose is defeated. It is like breeding illusion of another kind. We should therefore learn to respect our gurus and look to them for spiritual guidance, provided if they have time and energy to meet you, know about you and help you personally, as a teacher does to his students, not once in a year or two, not when you can manage to push your way through a frenzied mass of people to the front row, not when you are standing or sitting in an unending queue, but regularly, in person, whenever you need guidance or advice. It is better to wait for such a guru, even if takes long, rather than developing some illusory attachment and sense of dependency on a remote guru who is globally active, has a mass following, addresses a crowd, but does not have time for you or does not even know or vaguely knows that you exist and that you are fit enough for self-realization. Till you find one, prepare yourself, study the scriptures, practice religious discipline and fill your heart with a genuine aspiration for the right kind of guru, someone who can truly show you the self that is hidden behind the golden lid and connect you with your source. The prescription for today's spiritual dilemmas about gurus and their confusing ways is svadhyaya or self-study. When you are conversant with your own religion and its values, you will find a suitable guru with your buddhi (discriminating intellect) and save yourself and your family from problems. Remember the importance of svadhyaya is recommended by none other than Patanjali, the master of yoga himself. Compared to organized religions, Hinduism is at a great disadvantage because it does not have established patrons. Most of the philanthropic support goes to the temples, gurus and the institutions they create and uphold, not to Hinduism as a religion or a body of eternal knowledge. While such a parochial approach may help some sects and aspects of Hinduism, in the absence of political authority who used to be the upholder of dharma in previous times, the fate of Hinduism today is more or less like that of an orphan, seriously in need of commitment from dedicated people and institutions that can address the problems of Hinduism objectively and sincerely, without any hidden agenda, without any allegiance to any particular movement or ideology or ism or guru or even a divinity. This can be possible only if good people come forward and establish institutions both in India and elsewhere that are not affiliated to any political party or religious group or school of philosophy and which can serve purely as institutions and organizations of Hinduism. We are proud to declare that Hinduwebsite.com falls into this category and serves the mainstream of Santatan Dharma. If anytime in the history of the world there is an opportunity for Hinduism to spread out to various parts of the world and establish itself as a truly world religion it is now. This has become possible for two obvious reasons, the growing wealth of Hindus and their immigration to various parts of the world in recent times. Hinduism is not a missionary religion and will never spread to other parts of the world through acts of conversion. Religious teachers may establish various spiritual centers in different parts of the world and spread their own brand of Hinduism. But as it happened in the past, most of these sectarian movements will raise like flashes of individual brilliance and degenerate into smoke of confusion due to leadership or ethical issues. Hinduism will spread to other parts of the world, just the way vedic religion spread in India millenniums before, peacefully, through individual families and their religious activities and contributions. If Hinduism is going to establish its roots in different countries, it would be mainly through waves of immigrant Indian families and their religious practices. Knowingly or unknowingly, willingly or unwillingly, in their own limited and ignorant ways, these people would spread the awareness of Hinduism in the communities they live and gradually attract the attention of others. The souls who will be born in these countries and who are destined to become Hindus as a part of their spiritual salvation, will be attracted to their gatherings and become receptive to the ideals, beliefs and values of Hinduism. This is how Hinduism will become a beacon of eternal divine wisdom for the generations to come in different nations of the world. This is God's plan to take the Sanatana Dharma (eternal religion) beyond the shores of India, a process that is already in motion, which no force on earth can stop, unless the Divine wills otherwise, and which is the reason why India is shaping itself into an economic giant. Hinduism is a continuously evolving religion, with a lot of flexibility already built into it. There is a comprehensive scope and opportunity for Hinduism to mould itself according to the demands and aspirations of the modern world. Since Hinduism is not afraid of scientific explorations, nor the technological progress of mankind, it has the ability to align itself with both science and spiritualism in a balanced manner. Because of its emphasis on self exploration of Truth, without any allegiance to any particular dogma or prophet, Hinduism does not have to force the theories of Darwin or Mendel out of school rooms in order to justify itself, nor suffer from the compulsions of suppressing the freedom of human thought on medieval values in order to continue itself. A Hindu has the freedom to superimpose modern knowledge on his ancient theories and reinforce his own beliefs. He has the freedom to criticize certain aspects of his own religion, but still remain within its boundaries practicing a philosophy of his own that has its basis in its core values. What better example can there be than the fact that Internet, the world wide web, or the quantum physics all can serve as models to explain the basic concepts of Hinduism such as maya or the illusory nature of our existence or the theory of atoms propounded by the Vaisheshikas some 2500 - 3000 years ago?